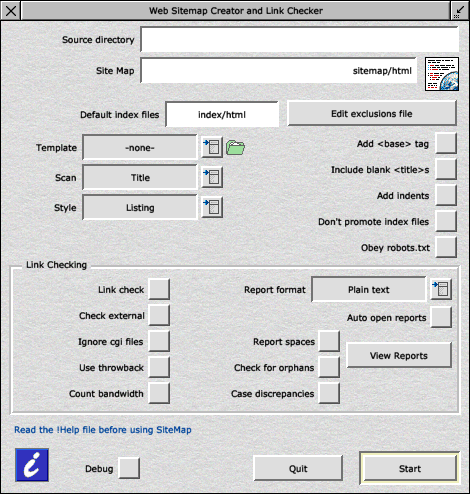 SiteMap is a small utility for automatically creating site maps from a source directory of HTML web pages. It can simplify the task of providing a quick index to every page on your website. This utility has a number of options, allowing you to scan a variety of HTML source files and optionally add a standard header and footer to the output. Various files or directories can be automatically excluded from the site map, allowing for hidden or non-indexed files to be ignored. SiteMap also includes link checking facilities to help you confirm that all your internal links to other pages work correctly. A number of useful reports are automatically generated, detailing any empty links, links to non-existent files or links to files outside the root directory of your website. You can even search for 'orphaned' files which are non-HTML files that are not linked to from any of your web pages. This is handy for spotting any old files which may have been moved, delinked but not deleted. From v1.10 SiteMap will also give you an approximate bandwidth analysis for each page, thus warning you to any pages which may potentially take a long time to download via dial-up or slow internet connections. SiteMap is relatively fast, and on average scans around 1000 files a minute on an Iyonix. To see some sample output produced, either click on the 'Site map' link at the bottom of the page, or click here. SiteMap v1.06 (and above) requires the DDEUtils module. This should be built-in to newer versions of RISC OS, but if you have an older machine you can download version 1.66 (32-bit compatible) either from RISC OS Open's web site (inside 'System') or a local copy from here [3.5K]. The main window, showing features currently available. There are plenty of options to allow good flexibility in what you can do with SiteMap. You can also save your choices as a separate file, so that you can have different settings for different web sites if you wish. Work out what to do about sub-directories with pages in them, but no index.html file. SiteMap forms part of my growing range of tools for making web design easier. The internet is one area where lots of users are interested in at the moment, and I'm always developing tools to make life easier for web designers, such as utilities for automating time consuming tasks. Users of SiteMap may also be interested in WebAnim8r for creating animated graphics for web and presentation, WebGallery for automatically creating online photo galleries from directories of images or Webworkz for converting Fireworkz spreadsheet files into HTML pages. If you have any ideas for future applications please contact me as I'm always looking for interesting utilities to write. go through a Web site (a set of HTML pages) and report on any links among those pages which don't point at anything. Checks all links and references between files on a site in a local directory and produces a "connectivity matrix". Click here to view a detailed history of SiteMap versions.